Olivia Morten is perfect. Maybe her high-flying publicist job has taken over her life, but her clients are Los Angeles' hottest celebrities. Maybe her husband is never around, but he is a drop-dead-gorgeous, successful doctor. Maybe her friends are dumb, but they know how to look glamorous at a cocktail party. And maybe her past harbors an incredibly embarrassing secret, but no one remembers high school…right? When Ben Dunn, Olivia’s high school arch nemesis and onetime crush, suddenly resurfaces, Olivia realizes how precarious all of her perfection is. As she finds herself dredging up long-suppressed memories from her past, she is forced to confront the most painful truth of all: maybe she used to be the fat girl, but she used to be happy, too. 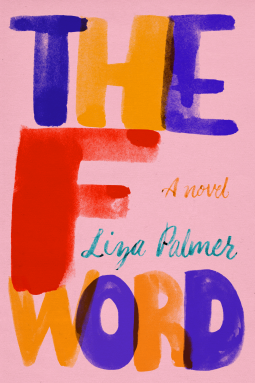 What I Say.....I could have sworn I had read a book by Liza Palmer before, but I've searched my blog and my Goodreads and must be having a moment, because I guess I haven't. I started The F Word, thinking it meant one thing, but it actually meant something else. Fat. Olivia used to be fat. It was interesting to find out what her one moment was - it's always one moment that makes you change your life. But Olivia has changed everything in the outside of her life, and not much on the inside. I do have to say that it took me the first half of the book to get into the story. I didn't really like Olivia, or Ben or really any of the characters except for Olivia's mother and her friends. Around the middle, I got into the story and wanted to finish to see what happened. And there was some personal realization and growth on Olivia's part, but it kind of stuck with me that fat or thin, she just wasn't a very nice person. In the book's description, it says "maybe she used to be the fat girl, but she used to be happy, too." I would argue that point, because it never sounds like she was happy, and in high school she seemed to actually be pretty vicious. I'm not super sure that her high school crush was all that great either, and although it was a book that made me thoughtful, it wasn't a book where I walked away caring about the characters in any way.